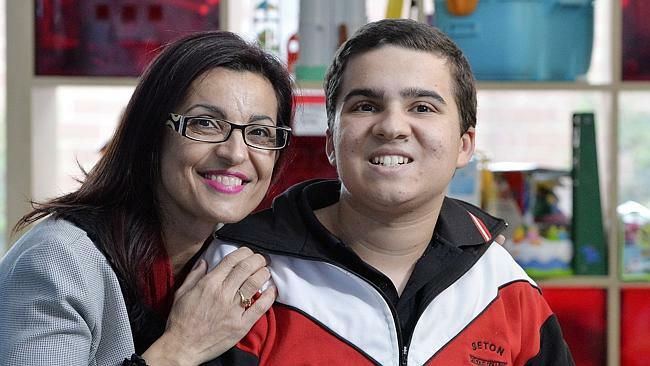 Silvana Gaglia with her son Julian, 17, at Autism WA. She is pushing for an autism-specific school in WA. TEACHERS are struggling to care for the skyrocketing number of students with autism while also looking after “30 other eager minds” in their classrooms. The number of students attending public schools that are being diagnosed with Autism Spectrum Disorder has doubled in the past five years to more than 3200 — up from 1600 in 2009. Yet, WA is the only major state without an autism-specific school. The Education Department insists mainstream schools are the “best way for students with autism to reach their potential”. But teachers on the frontline told The Sunday Times this week that schools are not adequately equipped to deal with autistic students, of whom “no two are alike”. Telethon Kids Institute head of autism research Andrew Whitehouse said WA was the only major state in Australia not to have an autism-specific school. NSW, Queensland and Victoria have several autism-specific schools. South Australia is set to get its first next year. Winthrop Professor Whitehouse said there was “a shockingly high rate of homeschooling among children with autism” because there are not enough options in WA. He said teachers aren’t receiving enough support “to help children with autism reach their full potential, while also educating 30 other eager minds”. “There is some evidence that autism-specific schools may be beneficial to some, but not all, children with autism,” he said. State School Teachers Union president Pat Byrne said the union did not believe WA needed an autism-specific school because there was support available through education support schools and autism-specific school programs. But Ms Byrne said many teachers missed out on extra support from the School of Special Educational Need because it was burdened by a “huge workload and cannot meet demand”. “Teachers do need more training in this area if they are to understand how autistic children learn, but this training is not always readily available,” she said. Education Department statewide services assistant executive director Martin Clery said the rise in students with autism in WA “reflects international trends”. “We continue to believe the best way for students with autism to reach their potential is to mix with other students in mainstream schools, with additional support provided when required,” he said. Students with autism can receive extra support or take part in tailor-made programs offered in primary and secondary schools. Mr Clery said schools would also receive funding for each child with a disability under the new student-centred funding model which starts next year. He said schools received a “fast response” to requests for support from the School of Special Educational Needs, and requests were prioritised based on urgency. “Direct funding to schools has increased in line with the rising number of students identified with autism,” he said. Friends of Autism head co-ordinator Heather Ioppolo said Australian children were being diagnosed with autism too late. “If they are diagnosed earlier, that’s less time for unwanted behaviours to kick in and we can start training them up earlier and make sure they’re ready for school,” she said. She believed that offering social skills training in mainstream schools would help autistic students, while also reducing bullying across the board. SILVANA Gaglia has been forced to settle for “good enough” for her son. The Kardinya mother said there were “very limited” educational options for children with autism spectrum disorder, such as her 17-year-old son Julian. As president of Autism West, she has campaigned for an autism-specific school in WA for many years. “WA is the only state that doesn’t have a dedicated school for people with autism spectrum disorder,” Mrs Gaglia said. “Personally, finding the right learning environment that is able to accommodate Julian’s educational, sensory and health needs to ensure he is reaching his full potential has been a challenge. Mrs Gaglia also wants more autism-specific sites. “It is our view that not all children with a diagnosis of autism require an intensive program, but the current choices and system are just not meeting the children’s individual needs,” she said.